The Samsung brand is best known for its smartphones and wide-screen TVs. Yet behind the scenes, the conglomerate is also making a name as a contract manufacturer of complex medicines to treat diseases like cancer. 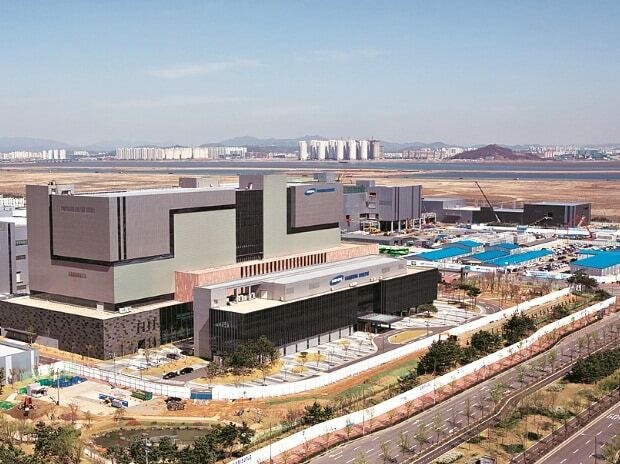 On a piece of reclaimed land along the western coast of South Korea, Samsung BioLogics Co. is building a $740 million factory that will give it the capacity to become the No. 1 producer by volume of a class of drugs called biologics, many of which are derived from mammal cells. The Samsung group diversified into the pharmaceutical sector in 2011. Now, it’s mobilising its expertise in semiconductor making and engineering know-how to make the way biologics are produced on behalf of Big Pharma more efficient. The market for biologic medicines, which are used for everything from cancer to arthritis, is projected to exceed $223.7 billion by 2021, according to a Bloomberg Intelligence analysis. Being a force in biologics is crucial to Samsung — and South Korea. Galaxy smartphones and other consumer electronics face intense competition from Apple and Chinese brands such as Huawei Technologies, and the chaebol is grappling with the arrest of de facto leader Jay Y Lee in a scandal that brought down the country’s former president. Meanwhile, the broader economy needs new industries as shipbuilding and heavy manufacturing slow. If the past 40 years of global economic growth were fuelled by technology, said Kim Tae-han, chief executive officer of Samsung BioLogics, the next will be fuelled by where that converges with health care. In an interview at company headquarters in Incheon, Kim said he is preparing to ramp up production and is in negotiations for more than 15 new contracts. The Samsung board gave him the green light and $2 billion to start the business about six years ago. Yet, on the strength of demand and business performance, “I’ve already spent $3 billion!’’ Kim said. Sales totalled 107.6 billion won ($96 million) in the first quarter, a 2.1 per cent increase from a year earlier, though the unit still posted a net loss. More than 2,000 construction workers — most with experience building semiconductor facilities — are buzzing around the factory site about an hour’s drive from Seoul. It is called Edison and is the company’s third drug facility. Its five floors encompass 34 meters (112 feet), making way for custom-made vats that are so big some shoot through several floors. Biologic drugs are grown from cells. That necessitates a more complex manufacturing process than typical pills — a mixture of chemicals — but makes biologics more effective and capable of being targeted toward certain diseases. Building a biologic plant is similar to one for semiconductors. There are clean rooms that cannot tolerate dust or other contamination, so Edison is being built without nuts or bolts to prevent any drilling. As such, everything is welded and tilted to fit together. One day, Kim said, “contract manufacturing” could extend to helping clients build the factories. Samsung already is a contract manufacturer for some blockbuster drugs, including for Switzerland’s Roche Holding AG and the US’s Bristol-Myers Squibb Co. It will take three years for the plant to ramp up to full capacity after being completed this year and opening at the end of 2018, Kim said. At its Incheon facilities, staff are on site 24 hours a day to ensure continuity: researchers in white smocks spend the day monitoring the production process, checking on centrifuges or poring over data on computer monitors. English is the working language and some are alums of Genentech Inc. or Amgen Inc., the US-based biotechnology giants. It has 1,700 employees, and their average age is 28, the youngest in the Samsung affiliates. Globally, the drug industry produces 4 million liters of biologic drugs a year, and that’s projected to double by 2030, Kim said. With its new plant, Samsung BioLogics is positioning itself to double its market share. Shares are up 24 per cent this year to 187,000 won. That compares with a 13 per cent increase in the benchmark Kospi index. Kim’s company faces some formidable competitors, who are also expanding. Switzerland’s Lonza Group AG and Germany’s Boehringer Ingelheim GmbH have long histories in the biologics contract manufacturing business, and Japan’s Fujifilm Holdings also entered the business. “We are aware of expansions and further investments in mammalian cell culture capacities by Big Pharma and contract manufacturers worldwide,” Boehringer Ingelheim said in a statement. It’s investing almost $767 million to build a production facility in Vienna that will create about 500 jobs, the company said in an email. Fujifilm is investing 14 billion yen ($123 million) to accelerate its drug-manufacturing capacity in the US and UK, it said in April. Through subsidiary Fujifilm Diosynth Biotechnologies, it’s targeting revenue of 100 billion yen for the contract development and manufacturing business by March 2024, it said in an email. Lonza declined to comment.